Sandals Royal Bahamian - Caribbean & Co.
Sandals Royal Bahamian Spa Resort & Offshore Island is a luxurious all–inclusive resort that delivers leisure in an oasis of ‘old world charm’ and understated elegance. This elegantly appointed resort looks out upon the crystal clear turquoise blue water of the Bahamas. A feeling of timeless elegance adorns the stately entrance and colorful bougainvillea that line the cobblestone driveway. In 1946, the original resort ‘The Balmoral Club’ was created to be the playground for many of the Royal friends of the then Governor of The Bahamas, the Duke of Windsor. The architecture portrays an elaborate sophistication, Roman columns and a large 25-foot tall statuary guard the entrance to the porte-cochere. 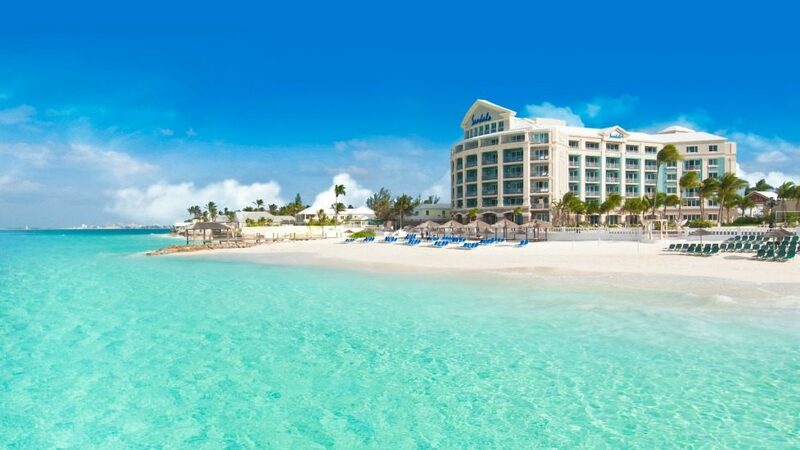 Sandals Royal Bahamian Spa Resort & Offshore Island is located on Nassau’s renowned Cable Beach, approximately 10 minutes from Lynden Pindling International Airport and 20 minutes from Downtown Nassau and Bay Street. Approximately 30 minutes from Paradise Island. • Sandals Royal Bahamian Spa Resort & Offshore Island has 404 rooms & suites across 26 categories on 15 Acres. • All rooms at Sandals Royal Bahamian include: air conditioning, mahogany four poster king-size bed, refrigerator, amenity kit, hair dryer, make-up mirror, telephone, private bath and shower, safe, iPod Docking Station, cable TV and iron with ironing board. • Butler Service, 24-Hour Room Service, and Rolls Royce or Mercedes Transfers for select Suite Categories. • Over 10,000 sq. ft. of the Island’s most impressive Freshwater Pools. • Sandals Island – Nassau’s only resort with Private Offshore Island & Restaurant. • Eleven Dining Options featuring an array of cuisine from French to Caribbean Seafood including Room Service for Butler serviced and Club Sandals accommodations. • A short transfer from the Lynden Pindling International Airport and minutes away from excellent duty free shopping in Downtown Nassau on Bay Street and world class gambling on Paradise Island. • The beautifully appointed Fred Kassner Conference Center, able to accommodate up to 540 persons Banquet Style and 1,000 persons theatre style. • An exclusive Penthouse Fitness Centre with panoramic ocean view. • Preferred Club Sandals Lounge check-in with chilled towel and champagne. • Weekly hosted activities like a Cocktail party, a Martini Evening, Wine tasting, Snorkeling and exclusive Island Routes Tours. • In Room/Suite and Lounge bars with scotch, vodka, rum, whisky, wine, beer, juices, sodas and water. • Relax with a kindle in the Club Sandals Lounge, while enjoying mouthwatering culinary treats, an assortment of teas and world renowned Blue Mountain coffee. • Room Service available from 7:00am to 10:00pm daily. • Voted Sandals Resorts – “World’s Leading All-Inclusive Company” 19 years in a row. • Voted Sandals Resorts – “Caribbean’s Leading Hotel Brand” 20 years in a row.